Endoscopic image of gastric MALT lymphoma taken in body of stomach in patient who presented with upper GI hemorrhage. Appearance is similar to gastric ulcer with adherent clot. The mucosa-associated lymphoid tissue (MALT), also called mucosa-associated lymphatic tissue, is a diffuse system of small concentrations of lymphoid tissue found in various submucosal membrane sites of the body, such as the gastrointestinal tract, oral passage, nasopharyngeal tract, thyroid, breast, lung, salivary glands, eye, and skin. MALT is populated by lymphocytes such as T cells and B cells, as well as plasma cells and macrophages, each of which is well situated to encounter antigens passing through the mucosal epithelium. In the case of intestinal MALT, M cells are also present, which sample antigen from the lumen and deliver it to the lymphoid tissue. The initial diagnosis is made by biopsy of suspicious lesions on esophagogastroduodenoscopy (EGD, upper endoscopy). Simultaneous tests for H. pylori are also done to detect the presence of this microbe. Esophagogastroduodenoscopy, (EGD) also called by various other names, is a diagnostic endoscopic procedure that visualizes the upper part of the gastrointestinal tract down to the duodenum. It is considered a minimally invasive procedure since it does not require an incision into one of the major body cavities and does not require any significant recovery after the procedure. However, a sore throat is common. In other sites, chronic immune stimulation is also suspected in the pathogenesis (e.g. association between chronic autoimmune diseases such as Sjögren's syndrome and Hashimoto's thyroiditis, and MALT lymphoma of the salivary gland and the thyroid). The salivary glands in mammals are exocrine glands that produce saliva through a system of ducts. Humans have three paired major salivary glands as well as hundreds of minor salivary glands. Salivary glands can be classified as serous, mucous or seromucous (mixed). t(1;14)(p22;q32), which deregulates BCL10, at the locus 1p22. t(14;18)(q32;q21), which deregulates MALT1, at the locus 18q21. These seem to turn on the same pathway as API2-MLT (i.e., that of NF-κB). They both act upon IGH,  which is at the locus 14q32. Atrophic gastritis (also known as type A or type B gastritis) is a process of chronic inflammation of the gastric mucosa of the stomach, leading to a loss of gastric glandular cells and their eventual replacement by intestinal and fibrous tissues. As a result, the stomach's secretion of essential substances such as hydrochloric acid, pepsin, and intrinsic factor is impaired, leading to digestive problems. The most common are vitamin B12 deficiency which results in a megaloblastic anemia and malabsorption of iron, leading to iron deficiency anaemia. It can be caused by persistent infection with Helicobacter pylori, or can be autoimmune in origin. Those with the autoimmune version of atrophic gastritis are statistically more likely to develop gastric carcinoma, Hashimoto's thyroiditis, and achlorhydria. Primary gastric lymphoma is an uncommon condition, accounting for less than 15% of gastric malignancies and about 2% of all lymphomas. 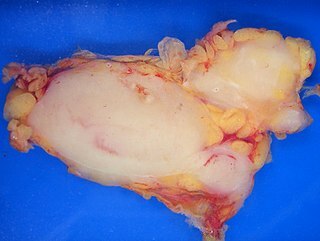 However, the stomach is a very common extranodal site for lymphomas. It is also the most common source of lymphomas in the gastrointestinal tract. Intravascular large B-cell lymphoma (ILBCL), also referred to as angiotropic large-cell lymphoma, angiotropic large-cell lymphoma, intralymphatic lymphomatosis, intravascular lymphomatosis, and, less specifically, intravascular lymphoma and malignant angioendotheliomatosis is a rare form of lymphoma. Marginal Zone B-cell Non-Hodgkins Lymphoma (NHL) is a type of lymphoma that affects B-cells in the marginal zones of various areas. Marginal zone lymphomas are slow growing and make up about 12% of all B-cell NHL. The median age for diagnosis is 65 years old and is primarily present in the stomach, intestines, salivary glands, lung, thyroid gland, lacrimal gland, conjunctiva, bladder, kidney, skin, soft tissue, thymus gland, and breast. The three types of marginal zone lymphomas include extranodal marginal zone lymphoma (MALT), nodal marginal zone lymphoma, and splenic marginal zone lymphoma. Marginal zone lymphomas are those that develop in the marginal zone or edge of the lymphoid tissue where B-cells are located. All marginal zone lymphomas are low-grade B-cell NHL. Nodal MZL makes up less than 2 in 100 NHL cases, MALT lymphoma makes up 1 in 13 NHL cases, and splenic marginal zone NHL makes up less than 2 in 100 NHL cases. Symptoms tend to vary from each individual patient and are often not enough to make an immediate diagnosis, as this cancer may have similar symptoms to other diseases. Prognosis and treatment are dependent on the location of the cancer and the stage of diagnosis. In pathology, lymphoepithelial lesion refers to a discrete abnormality that consists of lymphoid cells and epithelium, which may or may not be benign. Primary cutaneous follicle center lymphoma is a type of lymphoma. It was recognized as a distinct disease entity in the 2008 WHO classification. PCFCL had been previously conceived as a variant of follicular lymphoma (FL). ↑ Taal BG, Boot H, van Heerde P, de Jong D, Hart AA, Burgers JM (October 1996). "Primary non-Hodgkin lymphoma of the stomach: endoscopic pattern and prognosis in low versus high grade malignancy in relation to the MALT concept". Gut. 39 (4): 556–61. doi:10.1136/gut.39.4.556. PMC 1383269 . PMID 8944565. ↑ Jankowski J, Hawk E, eds. (2012). Handbook of Gastrointestinal Cancer (2 ed.). Chicester: John Wiley and Sons Ltd. pp. 243–244. ISBN 978-0-470-65624-2. ↑ Wotherspoon, AC; Doglioni, C; Diss, TC; Pan, L; Moschini, A; de Boni, M; Isaacson, PG (4 September 1993). "Regression of primary low-grade B-cell gastric lymphoma of mucosa-associated lymphoid tissue type after eradication of Helicobacter pylori". Lancet. 342 (8871): 575–7. doi:10.1016/0140-6736(93)91409-f. PMID 8102719. ↑ Parsonnet J, Hansen S, Rodriguez L, Gelb A, Warnke R, Jellum E, Orentreich N, Vogelman J, Friedman G (1994). "Helicobacter pylori infection and gastric lymphoma". N Engl J Med. 330 (18): 1267–71. doi:10.1056/NEJM199405053301803. PMID 8145781. ↑ Hatakeyama, M.; Higashi, H. (2005). "Helicobacter pylori CagA: a new paradigm for bacterial carcinogenesis". Cancer Science. 96: 835–843. doi:10.1111/j.1349-7006.2005.00130.x. PMID 16367902. ↑ Bayerdörffer E, Oertel H, Lehn N, Kasper G, Mannes GA, Sauerbruch T, Stolte M (August 1989). "Topographic association between active gastritis and Campylobacter pylori colonisation". J. Clin. Pathol. 42 (8): 834–9. doi:10.1136/jcp.42.8.834. PMC 1142061 . PMID 2768523. ↑ Park, Jeong Bae (2014). "infection in gastric mucosa-associated lymphoid tissue lymphoma". World Journal of Gastroenterology. 20 (11): 2751. doi:10.3748/wjg.v20.i11.2751. PMC 3961970 . ↑ Fischbach, W; Goebeler, M E; Ruskone-Fourmestraux, A; Wundisch, T; Neubauer, A; Raderer, M; Savio, A (1 December 2007). "Most patients with minimal histological residuals of gastric MALT lymphoma after successful eradication of Helicobacter pylori can be managed safely by a watch and wait strategy: experience from a large international series". Gut. 56 (12): 1685–1687. doi:10.1136/gut.2006.096420. PMC 2095715 . PMID 17639089. ↑ Sarah, Silverman. "MALT lymphoma Diagnosis, Staging, Treatment". pylori.org. UEG. ↑ Noels H, van Loo G, Hagens S, et al. (April 2007). "A Novel TRAF6 binding site in MALT1 defines distinct mechanisms of NF-kappaB activation by API2middle dotMALT1 fusions". J. Biol. Chem. 282 (14): 10180–9. doi:10.1074/jbc.M611038200. PMID 17287209. ↑ Liu H, Ruskon-Fourmestraux A, Lavergne-Slove A, Ye H, Molina T, Bouhnik Y, Hamoudi RA, Diss TC, Dogan A, Megraud F, Rambaud JC, Du MQ, Isaacson PG (January 2001). "Resistance of t(11;18) positive gastric mucosa-associated lymphoid tissue lymphoma to Helicobacter pylori eradication therapy". Lancet. 357 (9249): 39–40. doi:10.1016/S0140-6736(00)03571-6. PMID 11197361. ↑ Tomita N, Kodaira T, Tachibana H, Nakamura T, Mizoguchi N, Takada A (February 2009). "Favorable outcomes of radiotherapy for early-stage mucosa-associated lymphoid tissue lymphoma". Radiother Oncol. 90 (2): 231–5. doi:10.1016/j.radonc.2008.12.004. PMID 19135751. ↑ Schechter NR, Portlock CS, Yahalom J (May 1998). "Treatment of mucosa-associated lymphoid tissue lymphoma of the stomach with radiation alone". J. Clin. Oncol. 16 (5): 1916–21. doi:10.1200/JCO.1998.16.5.1916. PMID 9586910. ↑ Avilés A, Nambo MJ, Neri N, Talavera A, Cleto S (2005). "Mucosa-associated lymphoid tissue (MALT) lymphoma of the stomach: results of a controlled clinical trial". Med. Oncol. 22 (1): 57–62. doi:10.1385/MO:22:1:057. PMID 15750197. ↑ Conconi A, Martinelli G, Thiéblemont C, Ferreri AJ, Devizzi L, Peccatori F, et al. (October 2003). "Clinical activity of rituximab in extranodal marginal zone B-cell lymphoma of MALT type". Blood. 102 (8): 2741–5. doi:10.1182/blood-2002-11-3496. PMID 12842999. ↑ Martinelli G, Laszlo D, Ferreri AJ, Pruneri G, Ponzoni M, Conconi A, et al. (March 2005). "Clinical activity of rituximab in gastric marginal zone non-Hodgkin's lymphoma resistant to or not eligible for anti-Helicobacter pylori therapy". J. Clin. Oncol. 23 (9): 1979–83. doi:10.1200/JCO.2005.08.128. PMID 15668468. ↑ Lévy M, Copie-Bergman C, Gameiro C, Chaumette MT, Delfau-Larue MH, Haioun C, et al. (August 2005). "Prognostic value of translocation t(11;18) in tumoral response of low-grade gastric lymphoma of mucosa-associated lymphoid tissue type to oral chemotherapy". J. Clin. Oncol. 23 (22): 5061–6. doi:10.1200/JCO.2005.05.660. PMID 16051953. ↑ Zinzani PL, Stefoni V, Musuraca G, Tani M, Alinari L, Gabriele A, et al. (May 2004). "Fludarabine-containing chemotherapy as frontline treatment of nongastrointestinal mucosa-associated lymphoid tissue lymphoma". Cancer. 100 (10): 2190–4. doi:10.1002/cncr.20237. PMID 15139063. ↑ Jäger G, Neumeister P, Quehenberger F, Wöhrer S, Linkesch W, Raderer M (November 2006). "Prolonged clinical remission in patients with extranodal marginal zone B-cell lymphoma of the mucosa-associated lymphoid tissue type treated with cladribine: 6 year follow-up of a phase II trial". Ann. Oncol. 17 (11): 1722–3. doi:10.1093/annonc/mdl126. PMID 16766585. ↑ Zucca E, Conconi A, Laszlo D, López-Guillermo A, Bouabdallah R, Coiffier B, et al. (February 2013). "Addition of rituximab to chlorambucil produces superior event-free survival in the treatment of patients with extranodal marginal-zone B-cell lymphoma: 5-year analysis of the IELSG-19 Randomized Study". J. Clin. Oncol. 31 (5): 565–72. doi:10.1200/JCO.2011.40.6272. PMID 23295789. ↑ Ye H, Gong L, Liu H, Hamoudi RA, Shirali S, Ho L, et al. (February 2005). "MALT lymphoma with t(14;18)(q32;q21)/IGH-MALT1 is characterized by strong cytoplasmic MALT1 and BCL10 expression". J. Pathol. 205 (3): 293–301. doi:10.1002/path.1715. PMID 15682443.